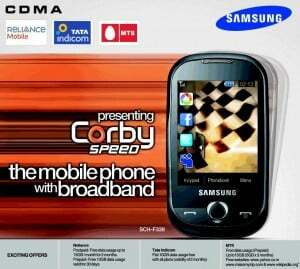 In a bid to promote newly launched power packed Samsung Corby Speed mobile phone (SCH-F339) among CDMA mobile service users of India, leading CDMA players Reliance Communications, Tata Indicom and MTS India announced attractive FREE Internet/Data usage offers bundled with the phone. On the purchases of Samsung Corby Speed, Reliance Mobile (CDMA) offers 15 GB FREE Data for its Post paid subscribers with a validity of 2 months while for prepaid users the Free Data cap is 10 GB with 1 month validity from the date of activations. Tata Indicom already introduces their specially tailored Plans for this new phone as earlier we shared on TelecomTalk. Indicom’s new and existing CDMA mobile subscriber who opt the Samsung Corby Speed will eligible to get FREE data usage of 10 GB with any plan with a validity of 2 months. MTS India the latest entrant in the CDMA mobile service market offers Free data usage of 15 GB with 3 month validity (5 GB x3 Month) with Unlimited Free access of Yahoo India, Wikipedia and MakeMyTrip travel website. 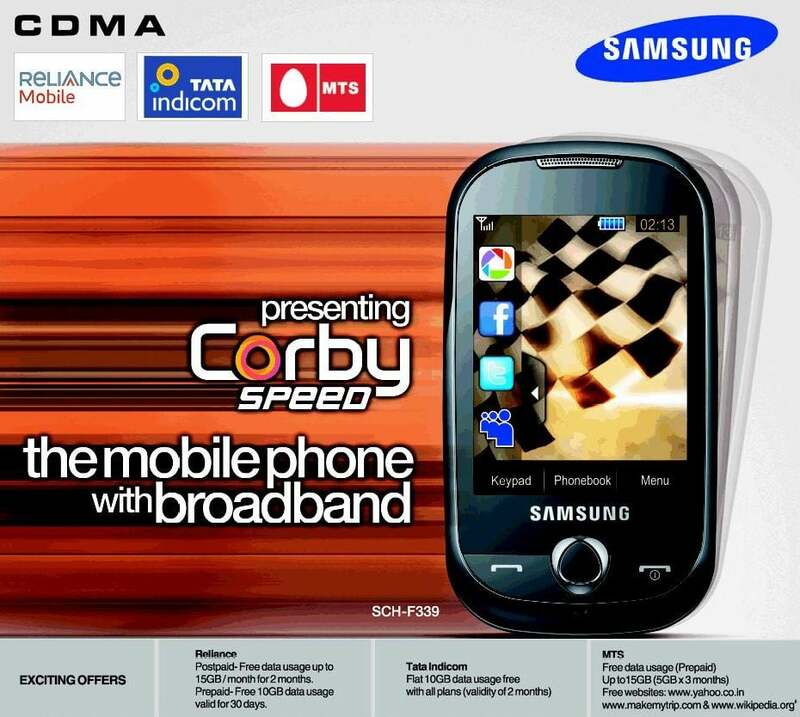 Samsung’s CORBY mobile phone range is already selling like ‘hot cakes’ phone and now the company added another charm to CDMA front in India with the launch of Corby Speed. Connectivity High Speed Data Connectivity for Internet surfing and Downloads up to 2.4mbps. USB v 2.0 HS-Easily connects to PC, Printer and other devices using high speed USB slot. Easy access to 8 Social Networking site like Facebook, MySpace and Twitter with instant sharing support. 29 pre install widgets with full one touch access. Free Internet/Data Usage offers bundled with handset Reliance Mobile-15 GB FREE Data for its Postpaid subscribers with a validity of 2 months while for prepaid users the Free Data cap is 10GB with 1 month validity. Tata Indicom- FREE data usage of 10 GB with any plan (Postpaid and Prepaid) with a validity of 2 months. MTS India- FREE data usage of 15 GB with 3 month validity (5GBx3 Months) with Unlimited Free access of Yahoo India, Wikipedia and MakeMyTrip travel website. can u give OMH card in TATA INDICOM.